Schedule Surgery by May 1st and Receive $400* off! If you’d like greater independence from glasses or contacts, you could be a candidate for laser vision correction. The most commonly performed type of laser procedure is iLASIK. An upgrade to traditional LASIK, iLASIK uses the exclusive Intralase Laser and is the preferred method of treatment for patients seeking a LASIK procedure. It effectively treats nearsightedness, farsightedness and astigmatism with only minor post-operative discomfort and a short recovery time. We offer iLASIK in addition to PRK procedures. 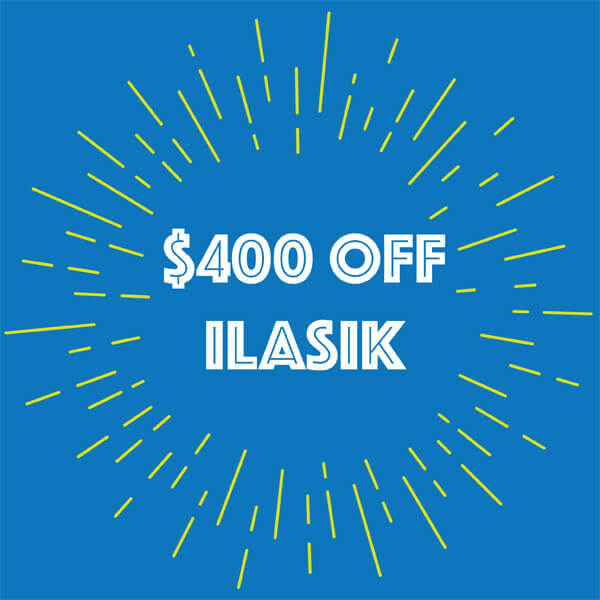 iLASIK is the latest in laser vision correction technology. So what’s the difference between traditional LASIK and iLASIK? It’s all about the corneal flap. Every LASIK procedure begins with the cutting of the corneal flap, which is a thin layer of tissue that is folded back to expose the inner cornea. iLASIK, also known as Intralase, blade-free LASIK or all laser LASIK, uses a laser to cut the corneal flap while traditional LASIK uses a blade. The remainder of the procedure is conducted exactly the same. After the flap is cut, the physician proceeds with reshaping the cornea and correcting the patient’s vision. It is safer, more precise and more comfortable way to preform laser vision correction. Benefits include a more customized flap fit, a reduced risk of infection and dry eye, and faster healing time. If you are not an ideal candidate for iLASIK because of thin corneas or dry eyes, then you may want to inquire about PRK. In an initial FREE consultation, our board-certified Ophthalmologists, Dr. Scott Peterman or Dr. Wes Ross will evaluate your condition and recommend a personal treatment plan. All LASIK procedures as well as other laser surgeries and minor operative procedures are performed locally in our on-site iLASIK suite; other surgeries are performed at local hospitals. At South Georgia/North Florida Eye Partners, we make convenience a top priority. Our new surgery center in Valdosta is state-of-the-art, and we’d love to give you a tour during your consultation. For our patients, this means we can perform procedures more frequently; therefore, allowing us to easily adapt appointments with the patient’s schedule. We can also schedule your pre- and post-operative visits in Valdosta, Tifton, Douglas, Moultrie or Madison, FL. Interested in learning more about iLasik?